Caldes de Montbui is a sleepy spa town of Roman origin just over an hour’s bus ride from Barcelona. It won’t feature in any guides or websites, the name even drew blank expressions from Barcelonans. I arrived on a lovely sunny spring day, to the sound of tweeting birds broken only by sound of the odd car. If you’re staying at the Hotel Balneari Termes Victoria in the Nucli Antic, it’s probably best take a cab from the bus station as it can be hard to negotiate the winding cobbled streets of the old centre. The hotel rooms have private balconies, and the ones to the rear have lovely views of the wooded hillsides and the stream below. There is free wi-fi in the rooms and international channels on TV. There are thermal baths in the hotel but sadly I never got round to trying them. I went for lunch straight away at El Pa Torrat (Elementary B) at 5 C/Bellit (immediate first right off C/Vic, off the square), a simple family-run restaurant/pizzeria/llesquiria which the crude town map from reception indicated to be the nearest. Three generations move at varying speeds around the place, the oldest monitoring the blaring state-of-the-art Samsung above the bar and the youngest scampering around looking for missing sports kit. The eager youngish chap who served me is an interesting example of the perils of teaching yourself a language. He has a couple of situational self-study books under the counter that he dips into but doesn’t listen carefully and gets the wrong end of the stick every time. After some negotiation I managed to procure the very reasonable Menu del Dia for €9.50. A plain tuna salad was followed by a dish of tasty cubes of pork sautéed in paprika and spices with French fries and Pressec amb Almivar (tinned peaches) to finish. The best part was the very pleasant half litre of house rose. Initially my heart sank when I walked in to this place having had a recent bad experience with a similarly modernist restaurant. However my initial disquiet over the glass-walled kitchen, uncomfortably looking banquettes and being the only customer on a Monday night was soon dispelled by the huge collection of food books running the length of the room, including some by my favourite food novelist, Anthony Bourdain, actually on the table. The fast-talking bubbly waitress took my language inabilities in her stride and made me feel at home straight away. 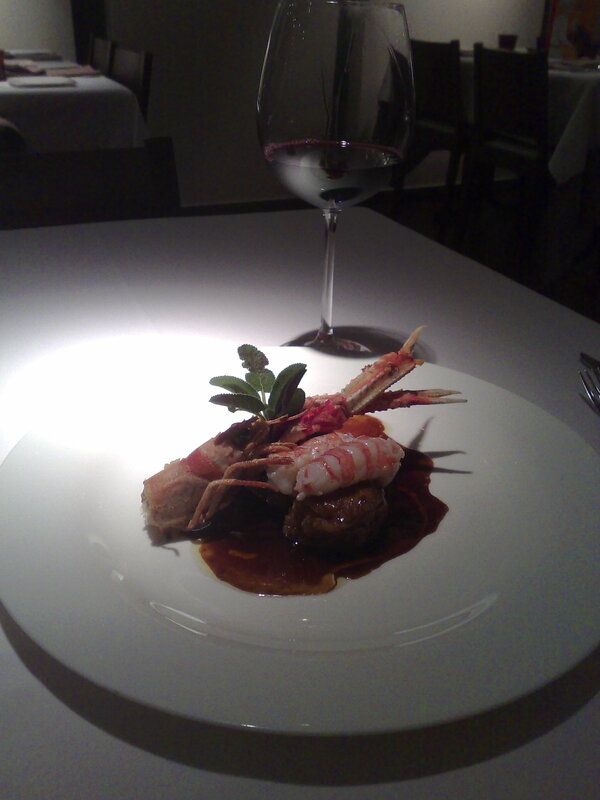 The menu is modern Spanish with a strong Italian influence. After a complementary tapa of fried /sonshu:/ (baby hake), I went for the classic Catalonian dish of Canalones (always stuffed with veal and covered with melted manchego), both wonderful. I thought I’d take a risk on the Manita de Cerdo Rebazado con Cigales thinking this would be the right place to try pig’s feet but was surprised by their arrival as two meatballs topped by langoustines (cigales is a Spanish wine variety as well as the plural for crayfish in Catalan) surrounded by a powerful brown jus. I’m not usually a fan of seafood/meat hybrids but on the palate the combination tasted a lot better than I thought it would. My only complaint was the lack of vegetables which didn’t seem to feature in the menu. Given the similarly bemusing absence of a wine list, I went with the server’s excellent choice of a Rioja Classico; Marques de Vittoria (Crianza ’05). I passed on dessert and went instead with a fine Orujo des Hierbas (Port a Mino, 35%), poured high in a grappa glass, the bill came to €50 including a 10% tip. In a nutshell, flavoursome haute cuisine well made but perhaps not justifiable every day of the week. Robert de Nola Restaurant (Advanced Grade 11, A) 48-50 Passeig dei Remei, Tel. 93 865 40 47. GEM ALERT! This is a great place, flavoursome food beautifully presented and tremendous value-for-money. The restaurant itself is modern and very dimly lit with black slate floors and dark wood ceilings. Add carved wooden screens, tasteful modern art on the walls and a low soundtrack of soft jazz and you have a very relaxing dining experience. The proprietor Josep Riu will modestly protest he’s not a great speaker of English but in fact he talks about food very well and with great passion. If he’s available get personal service from him as he will be tell you about several things that aren’t on the Catalan menu. After some complimentary croquettes and delicious tiny olives I got Basonets de Bacalla amb Mel (batons of cod deep fried and dipped in honey, Canalo de Foie amb Amanida de Meduixots (pastry containing duck liver and salad with a balsamic reduction), Calcots Arrebossats (green onions deep fried in batter) amb Romesco (a sauce of almonds, hazelnuts, nyora pimento, tomatoes, oil and a in this case a little orange juice) and Carxofs Farcides amb Bolets amd Cansalada (artichoke heart with topped cod soufflé and melted manchego), which scored A/B /B/B). The fish course was Corball amb Amanida de Meduxiots (hake with a cheese sauce and something akin to an artichoke guacamole (B+) and the meat was Meloses de Vedella (two chunks of boneless veal slow-cooked in a casserole with tiny mushrooms in a strong brown gravy) which was fabulous (A), flaking tender meat with an intense flavour. The perfect accompaniment to the latter was a full bodied red called Pederats 2005 from the Priorat DOC near Tarragona, a fantastic (A+) bottle of wine for only €17. To finish some crunchy sandwiches of a chocolate covered relative to spinach (but bigger) which were ok (B) and the sublime Mil Fulls amb Crema de Llimona i Sorbet de Mandarina (wild strawberries in a creamy citrus sorbet) (A). My request for a digestivo resulted in five bottles arriving at the table all of which were complementary! Vi de Tavarp (spelling?) a red dessert wine, Garnatxa Vi de Postre (amber fortified dessert wine), Flor del Remei (?) an iced green herbal (but not overpowering) liquer which Caldes is known for, Anis del Mono de Naranja, a red aniseed liqueur similar to Pacharan with ice but nicer and Marc de Can a local grappa (spellings may be dodgy, like Robert’s handwriting!) which scored B/A/B/A/A respectively. I was also given some Carquinyolis, small coffee biscuits that seem a direct relation of amaretti and again a local delicacy). And all this for only €56! The best place in town, hang the cost and look no further. For me, a job-affirming experience. So how could I not go back the next day! Had already ordered half my meal from the pleasant young waiter when Josep showed up to better inform my choices. To start I had the wonderful Formatge de Cabra amb Poma i Confitura (hot goat’s cheese on slices of apple with a tomato preserve to dip into) on the same plate as a fantastic salad of mixed leaves, strawberry, apple, mandarin, pomegranate, toasted hazel and pine nuts and decorated with balsamic and tiny pieces of dry ham (all A). Sadly the two following fish dishes Sopa de Peix (monkfish and rice) and Romescada de Peix (monkfish, mussel, clams, shrimp and sliced potatoes in thin romesco) were strangely lacking in flavour (C) but these were my choices not Josep’s. The white semi-sec ‘Labalis’ (Castille de Maetierra) from Valles de Sadacia made up for things however (B+). 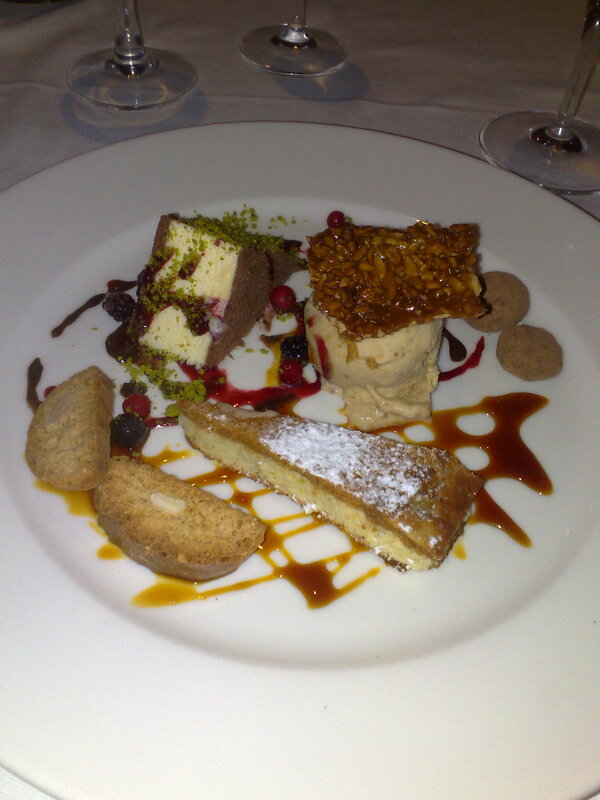 Although the dessert cava ‘Privat’ from Alella was nothing special (C) it went well with the plate of assorted desserts, the highlights of which were a delicious semi-freddo topped with almond toffee and a cheesecake (both A) decorated with black and red gooseberries. Along with a plate of complementary chocolates I was also given coffee (C) and honey (B) versions of orujo but decided I preferred the original. Once again a steal at €57. Lesson relearned, if you have a good server, go with their suggestions. N.B. According to Joesp, Robert di Nola was probably a medieval noble or chef who wrote one of the earliest Catalan cookbooks. Placa San Angel (right out of the hotel, left at the church) has a couple of okish cafes where you can sit outside on a sunny day. La Rosa de Caldes (High Elementary, B/C), 87 C/Pi i Margall (on the main street near the bus station, one block down from Carturan above). This was the best value-for-money Menu del Dia I could find, 4 courses with a drink for €9.25 for which I got a garden salad, well-made fideua with cuttlefish and crabstick (yuck! ), small Walls-type sausages in samfaina (ratatouille), a piece of fresh fruit and a half litre of cold red wine. Nothing special but all perfectly edible/drinkable. Went again the next day and had the ‘fish of the day’ which turned out to be deep fried calamari rings which I’m not keen on. When I queried their choice of language they apologised and kindly offered another dish but I was already full anyway from the preceding seafood paella. The interior includes a cafe bar, flashing fruit machines, a big TV and rather a lot of smoke from the kitchen. Fine for a cheap basic lunch and a convenient location opposite the bus station. If you go through the gateway next to Can Ruis on C/. Pont you can go over the small bridge over the gorge and into a small park. If you walk through this you get to the municipal sports centre which has a nice modern 25m indoor swimming pool. You can swim anytime between 6.30am till 10pm for €4.50. Remember your cap. For a pleasant run or walk go straight past Robert de Nola Restaurant above till you get to the pretty church and Restaurant El Remei (you can sit outside here to eat). Follow the path between them which becomes a sandy track as it goes under the road and winds through allotments and small fields. You could probably get a 30 minute return run in without meeting any traffic. If you go left at the church instead and followed signs to the campsite, the roads are still very quiet. This entry was posted on September 11, 2010 at 6:46 pm and is filed under Caldes de Montbui, Catalonia, Spain with tags Caldes de Montubi, Catalonia, food, restaurants, Spain, travel. You can follow any responses to this entry through the RSS 2.0 feed. You can leave a response, or trackback from your own site.